PETALING JAYA: I-Bhd executive chairman Tan Sri Lim Kim Hong is meeting top developers from Asian countries to discuss the expansion of the RM2bil I-City project in Shah Alam. “We are looking for a big brand that is strong in property development to spearhead the next phase of growth in I-City,” he told StarBiz yesterday, adding that he was interested in the development concept of Shenzhen. So far, he is targeting to meet the top three developers in Singapore, Hong Kong, China and Taiwan. “Tan Sri Hamad Kama Piah (the president and group CEO of Permodalan Nasional Bhd – PNB) has done a good job as non-executive chairman, building up the infrastructure and network for the group,” said Lim. PNB has an 18.1% stake in I-Bhd. Hamad, who was appointed non-executive chairman early last year, has resigned as non-executive chairman and director and is replaced by Lim, who was previously deputy executive chairman. No reason was given for Hamad’s resignation but for Lim, the post of executive chairman is helpful when it comes to meeting big developers in the Far East as they are often interested to discuss with the top man himself. I-City has obtained the MSC Malaysia Cybercentre status from the then-Ministry of Science, Technology and Environment, and was endorsed as a tourism destination by the Tourism Ministry as well as given international park status by Selangor state government. For the 12 months ended Dec 31, 2009, the group posted an after-tax profit of RM900,000 compared with RM15.3mil for the last financial year, mainly due to lower sales of completed units. A final dividend of 3% comprising 1.77% less 25% income tax and 1.23% single-tier dividend was paid. By the first quarter of this financial year, it had incurred an after tax loss of RM1.45mil compared with RM1.72mil in the last financial year. “In two years, we will have to improve the dividend and expand the ICT as well as international park,’’ said Lim. Among the key components in I-City are the data centre park comprising four blocks of tier-4 data centres, the cybercentre office suite, the technopreneur centre and city of digital lights. There are now 100 MSC tenants in the ICT. “We have to find out the concerns that foreign investors have and relay them to the state government,” said Lim, adding that assurances in black and white could be sought. On the non re-election of Datuk Abu Hassan Kendut as director, and hence chairman of the audit committee, Lim said Abu Hassan did not seek re-election as a director. Apart from Abu Hassan, the other independent director who resigned from I-Bhd was Datuk Pengiran Mohd Hussein Mohd Tahir Nasruddin, who is now ambassador to Cambodia. The board is looking to fill up these two positions in the audit committee which has only one member, independent director Monica Ong. Manharlal Ratilal, a director of KLCC Property Holdings Bhd., comments on the developer’s new office and retail tower called Lot C which is scheduled for completion in Kuala Lumpur in October 2011. KLCC Property’s main asset is the 88-floor Petronas Twins Towers in Malaysia’s capital, formerly the world’s tallest building. It is spending close to RM1 billion on Lot C, a new 59-storey tower complex next door with 840,000 square feet of rentable office space and 140,000 square feet of retail space. Manharlal spoke to reporters after the company’s annual general meeting in Kuala Lumpur today. He also comments on the outlook for Mandarin Oriental Hotel, another property it owns neighboring Petronas Towers. Do property bubbles always lead to crises? Many of the world’s biggest economic crises in recent years originated from property bubbles. The list includes the US “subprime” crisis (2008), Japan’s economic stagnation (1992 onwards); and the financial crisis in Sweden (1991), Finland (1991), Norway (1987) and Spain (1977). They were all largely triggered by property bubbles popping. Today, it is therefore understandable that investors are concerned about property bubbles in Asia, especially in China; how would the property bubble affect China’s economy, and by extension Asia’s and the world’s economy. The important question today I believe is not whether major economic crises are usually triggered by property bubbles, but do property bubbles always lead to banking and economic crises. Property bubbles certainly increase economic downturn risks, especially when they pop. However, we do not think it will always lead to a banking and economic crisis. First, property bubble-induced economic crises occur largely because there is cheap money (i.e. low borrowing cost) and excessive bank lending, giving rise to investment frenzy, including speculation. When the bubble pops, banks’ non-performing loans (NPLs) rise, causing banks’ capital to be insufficient. Confidence about banks’ financial health then comes into question, which may lead to a bank run. Banks are then forced to cut back on credit, which in turn affects the economy, turning the property price collapse into an economic crisis. The key to see if a property bubble burst leads to an economic crisis or not is whether there is excessive lending (high margin, lax lending) and substantial lending (high total banking exposure to property). One case in point is the China property bubble burst of 2008 where some house prices in Shenzhen dropped as much as 40% (yes, there was one, overshadowed by the much bigger US property bubble popping) but there was no banking crisis. 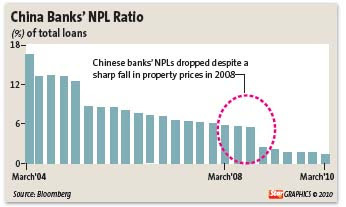 Surprisingly, NPLs of Chinese banks did not rise in 2008 (as one would expect when property bubbles burst); instead they continued to fall (China’s total bank NPLs have fallen from above 12% of total loans in 2004 to 1.4% in 2010). Until today, China’s banks are relatively secure because many buyers are required to pay high down payments (from a minimum of 20% to 30% for first mortgage, to 40% to 50% for subsequent mortgages). This high commitment of home buyers partly explains the lower risk for banks and the low default rate of mortgages (NPLs for China banks in mortgage loans are traditionally low, now at about less than 1%). Another example is high-end properties in Hong Kong and Singapore. While there is no doubt it is a property price bubble, the systemic risk to the banking system and economy is less because it is more prevalent to luxury properties, coupled with less excessive bank lending. Second, the size (volume and price) of a property bubble determines the negative impact to the economy when it pops. To illustrate, if the price of a single property unit increases significantly and then crashes sharply, there is really little impact to the economy. However, if there were millions of such transactions built up over the years, chances are that when the bubble pops, it will have very severe damage to the economy. In Asia, recent property bubbles had relatively short time to build. Take, for example, the high-end property bubbles in China, Hong Kong and Singapore, which started approximately from about 2006 before they tumbled in 2008. Compared with the build-up for the last supersize property bubble of the US (estimate from 2001 to a collapse in 2008) or Japan (estimate from 1986 to 1991), the run-up in Asia’s property bubbles today (essentially from 2009) has perhaps less time to accumulate high numbers of property transactions to reach a supersize bubble. For example, on Sept 30, 2006, US Federal Deposit Insurance Corp data showed real estate loans might be in excess of 40% of US banks’ total lending. As comparison, according to a PIMCO report in 2010, the share of loans in China’s real estate sector is less than 20% of total lending. So, should we be worried about the impact of property bubbles bursting in Asia, bringing Asian economies towards an often quoted “double-dip recession”? ·Asia’s banking system is resilient after the 1997/98 Asian fiinancial crisis revamp and remained strong, during and after the 2008 global financial crisis. ·Asian governments are acting very fast in curbing property bubbles, not allowing them to get too big; in particular Asian governments believe in market intervention as compared with Western preference to let free market forces decide. ·Asian bank housing mortgages are “recourse financing” (meaning one is liable for all losses even if the property is auctioned) as compared with “non-recourse financing” in the US (meaning after the property is foreclosed by the bank, one is no longer liable for further losses), therefore Asia’s borrowers are more committed. ·It is a cultural norm and quite common in Asia for an extended family to chip in during times of difficulties to help mortgage repayment. ·Asia’s property developers are also more careful in managing risks after experiencing the 1997/98 Asian financial crisis; many, such as in Malaysia and Singapore, use joint ventures with land owners to mitigate some of the risks. Bandar Raya Development Bhd (BRDB) is buying Limitless Holdings Pte Ltd's stake in a RM2.3 billion waterfront project in Johor to strengthen its presence in the region and improve earnings. BRDB, well known for its developments in the Bangsar enclave, Kuala Lumpur, wants to build more properties in Johor, riding on the success in Iskandar Malaysia, a spokesperson said. "We calculated and evaluated the deal before buying the stake. It worked out well and we found it good value for our shareholders," the spokesperson added. Based on a preliminary feasibility study, the project, dubbed "Residential North", is expected to generate gross development profit of RM700 million. Construction work on the development featuring bungalows, detached houses, townhouses and condominiums in Puteri Harbour is expected to start in the third quarter of next year. The project will take some six years to complete. Limitless, a unit of the cash-strapped Dubai World, holds 60 per cent of Haute Property Sdn Bhd, which was formed in December 2007 to undertake the 44.4ha project. UEM Land Bhd, the master builder, owns the remaining 40 per cent. It was reported that Limitless had decided to pull out of the project to raise cash and that BRDB had bought into Haute via its unit, Ardent Heights Sdn Bhd. Ardent will pay Limitless RM75 million, which the latter had advanced to Haute as partial payment for development rights to the project. It will also pay Limitless RM1 million to settle about RM10 million it had advanced to Haute to meet the latter's operating and development expenses. "We are happy with the deal and also to be able to work with UEM Land, a reputable developer. We feel this is a good match. This is our first partnership together and we hope there will be more in time to come. "We are seeking opportunities to grow in Johor and this is just one of the many plans we have," the BRDB spokesperson said. BRDB is not new to Johor, having ventured there in the 1980s. By month-end, it will launch Straits View Residences in Permas Jaya, the first gated and guarded development in Johor with strata titles. UEM Land, in an e-mail reply to Business Times' query, said there would be no impact on the project as BRDB was essentially stepping in to replace Limitless. "We had decided to partner Limitless to tap their expertise in upmarket waterfront development and take advantage of their international market reach. "Unfortunately, once the global financial crisis hit, we were unable to move this project forward as Limitless became entangled as part of the Dubai World group's debt restructuring plan, which in turn hindered the ability of Limitless and Haute to raise the required project financing. "Because of this, both UEM Land and Limitless agreed to explore possible solutions to enable the Residential North project to move forward and we eventually agreed that BRDB replace Limitless as our joint-venture partner for this project," UEM Land said. "In fact, with BRDB now coming in, we should be able to move the Residential North project forward," it added. UEM Land said it was finalising the necessary agreements with BRDB and discussions were ongoing. On project financing, UEM Land said it expects funds to be a mix of equity and debt (mainly project or bridging finance). "Details of the funding plan will be finalised later, but, based on the financial strength of both BRDB and UEM Land, we do not foresee this to be an issue," it said. 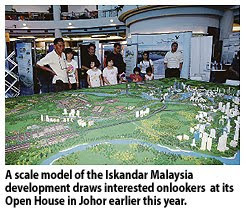 Bandar Raya Development Bhd said it signed an agreement with Multi-Purpose Holdings Bhd. to jointly develop land totaling 670 acres in the Penang, Rawang and Gombak districts of Malaysia. Bandar Raya’s business strategy is to enlarge its development land bank via joint ventures to improve profitability and shareholder value, it said in an exchange filing today. iProperty.com Malaysia will present its Expo Luxury Collection 2010 at the Kuala Lumpur Convention Centre from July 30 to August 1, 2010. The three-day event, with a total exhibition space spanning some 6,000 square metres, features over 100 property developers showcasing over 300 developments across the world, iProperty.com said in a statement today. The expo, which will be the largest property event in Malaysia, is expected to attract more than 20,000 high net-worth home buyers and real estate investors from both local and international markets, the company said. Local property developers include Sime Darby, Mah Sing, SP Setia, Ideal Homes, Dijaya Corporation, Glenmarie Cove, Putrajaya Homes, CDB Perdana, The Haven, Marina Island, Land & General, UEM Land, AP Land, IJM, TA Global, UDA Holdings, Mayland Development and Danga Bay. International property investors will also find a range of distinguished properties in key high growth cities from Australia to Canada, iProperty.com said. The showcase also features free property and investment seminars hosted by some of Malaysia''s most influential property market experts, international fund managers, trainers and best-selling investment authors, the company said. "Expo Luxury Collection 2010 connects buyers and developers at an opportune time, with the ringgit strong against the dollar and demand for property at a high," said iProperty.com''s country manager Ken Tsurumaru said. "Those keen to expand their financial portfolios with luxury real estate as a hedge against rising inflation should definitely visit the iProperty.com Expo Luxury Collection for excellent investment opportunities," he said. Visitors will be able to enjoy incentives, including special on-the-spot home loan approvals for properties purchased at the exhibition and promotional giveaways exclusive to the show, iProperty.com said. KUALA LUMPUR: Sunway City Bhd yesterday entered into a share-sale agreement with Sunway Pyramid Sdn Bhd (SPSB) for the proposed acquisition of Mega Capacity for RM2.8mil. In a filing to Bursa Malaysia, the company said it also entered into an agreement with Reco Pyramid (M) Sdn Bhd (RPSB) to acquire 48% equity in Sunway Pyramid and an agreement with Reco Resort Hotel (M) Sdn Bhd (RRHSB) to acquire 9.6 million ordinary shares of RM1 each in Sunway Resort Hotel Sdn Bhd for RM12.144mil, subject to post-closing working capital adjustment. “RPSB and RRHSB have expressed their interest to dispose of their respective 48% stake in SPSB and Sunway Resort upon completion of the disposal of Sunway Pyramid and disposal of hotels which were owned by SPSB and SRH respectively to Sunway REIT,” it said. Sunway City will continue to engage in the hotel business through its subsidiaries as SRH is the master lessee of the hotels and Sunway International Hotels & Resorts Sdn Bhd is the operator of the hotels as well as being engaged in the management of Sunway Pyramid shopping mall. MELATI Ehsan Holdings Bhd's wholly-owned subsidiary, Bayu Melati Sdn Bhd has entered into a development agreement with Tengku Shahrudin Sdn Bhd to undertake a residential development project. The proposed development, known as Bukit Tengku Shah Alam, will allow Melati Ehsan through Bayu Melati to generate revenue and profits to the group. The proposed development would expand the property market of the Melati Group in a strategic location in Selangor. PENANG-based Ivory Properties Group Bhd, which postponed its listing in May, is now expected to float is shares on July 28. In a statement to Bursa Malaysia yesterday, the company said balloting of share applications will be carried out on July 21. AmInvestment Bank is the managing underwriter for the firm’s initial public offering, which will raise RM45 million in proceeds. BEIJING: Chinese property prices in June recorded their first monthly fall since February 2009, providing further evidence that a government drive to let the air out of an inflated market is working. Average prices in 70 cities edged down 0.1 per cent from May, lowering the annual property inflation rate to 11.4 per cent in June from 12.4 per cent in the year to May and April's reading of 12.8 per cent, the National Bureau of Statistics said yesterday. Coming on the heels of much slower import growth and a controlled moderation in bank lending, the figures reinforced the conviction of many economists that no further policy tightening is on the cards. However, with surprisingly resilient exports offsetting softer domestic investment, the consensus is that Beijing will not be rushed into relaxing policy either until clearer signals emerge from the all-important property and construction sectors. Ren Zhiqiang, the outspoken chairman of Huayuan Property, cast doubt on the potential for any imminent change. "The current policy will last for a pretty long period of time," he told a forum. "The government will not lightly ease policy." "Currently the Chinese property market's at a crossroads. It's a game of who blinks first," said Dong Tao, chief China economist at Credit Suisse in Hong Kong. "This is a turning point of the overall property price trend," Yang Hongxu, a Shanghai-based analyst with E-House China R&D Institute, said. "The decline will continue for several months once the trend is consolidated - probably lasting into the end of this year or the beginning of next year," he said. Chinese authorities have issued a slew of measures in recent months as they seek to prevent the property market overheating and causing a bubble that could derail the world's third-largest economy. The authorities have so far tightened restrictions nationwide on advance sales of new developments, introduced curbs on loans for third home purchases and raised minimum down-payments for second homes. Chinese media reports have said a property tax could be imposed on a trial basis in Beijing, Shanghai, the southwestern mega-city of Chongqing and the southern city of Shenzhen. Qin Hong, a senior researcher at the housing ministry, said China would impose the tax "at an appropriate time" as a "long-term measure" to regulate the sector, the official Securities Times reported yesterday. China currently has no such levy on residential property but does impose a 1.2 per cent tax on 70-90 per cent of the value of commercial real estate. PETALING JAYA: Property developer LBS BINA GROUP BHD is issuing RM135 million sukuk to part finance three projects in Malaysia, group managing director Datuk Lim Hock San said on Tuesday, July 13. The proceeds will be utilised mainly for proposed development projects in Bandar Putera Indah in Batu Pahat, Johor, Puchong in Selangor, and Taman Royal Lily in Cameron Highlands, he said. "The total gross development value of the three projects is RM600 million," Lim told reporters after a signing ceremony for the issuance witnessed by Housing and Local Government Minister Datuk Wira Chor Chee Heung here on Tuesday. The sukuk will be the first private-debt Islamic securities issuance in Malaysia to be guaranteed by Danajamin Nasional Bhd, the nation's first financial guarantee insurer. EON Bank Bhd's unit MIMB Investment Bank is the principal adviser and lead arranger for the issuance. The first tranche will be within the current month. On the projects, Lim said the 26 units of medium-cost properties in Cameron Highlands were all sold, while the Batu Pahat project and high-end super-link three-storey properties in the D'Puchong project will be launched within 2010. "We are confident that the units will be taken up very fast," he said. The group has a landbank of about 930.7 hectares in Malaysia and China, which will ensure its continuous operation for the next 10 to 15 years. Its executive director Alan Chia said with the launch of the new projects and some launches in 2009, the group aimed to return to profits in 2010 or 2011 after registering its first loss last year. "In 2007 and 2008 we foreseen the crisis coming and therefore we did not launch any medium range product. But in 2009 we were aggressive in launching new products," he said. Chia said in 2009 sales touched RM317 million and for this year sales had so far reached RM180 million. "Profit of the sales will come in this year and it will be realised next year. So, we expect to break even or post a small profit this year and better profit in 2010," he said. Lim said more projects would be launched this year amid the favourable outlook for the property market for the next two years. "With Danajamin guarantee, the issue will be rated AAA (fg), thus allowing LBS Bina to raise funds from the sukuk market at a competitive rate, even in this risk-adverse environment," said EON Bank Group's chief executive officer Michael Lor.